Matinee feels like a skeleton key for Joe Dante's entire career. It combines satirical targets and stylistic influences typically given their own feature. Sociopolitically, the film spoofs the influence of militarism on American society and how that militarism informs our consumerism and entertainment. Aesthetically, it blends the Corman-esque, effects-driven monster movie with a metacinematic, giddy humor that invokes early Warner's cartoons. At times it can be unwieldy, but Matinee bursts with such jubilant energy that its escalation of self-destructive mania is almost necessary just to keep the whole frame from catching fire. But then, it sort of does that in the end anyway. Set in Key West during the Cuban Missile Crisis, Matinee plays on fears of nuclear annihilation, with an emphasis on "play." Instead of focusing on the threat of destruction, Dante tracks the release of a B-movie perfectly timed to capitalize on national anxiety. When Lawrence Woosley (John Goodman) learns of the build-up of ships and tension in international waters just south of Key West, he does not cancel a planned screening of his radiation-themed horror movie. Rather, he can barely contain his glee, fully aware that terror over a launch will only make people want to see his picture more. In his shrewd calculation is an unexpectedly poignant point about the cultural necessity for the horror genre. This is especially true of the children wandering around Key West. Gene (Simon Fenton) and his younger brother Dennis (Jesse Soffer) spend their free time at the local cinema watching the latest monster movies, Gene teasing his sibling for being frightened only to get a few jabs of his own when a jolt catches him unawares. Their mother chastises the boys for only seeing horror movies and makes them go to a comedy, but the two barely settle into their seats before leaving, completely and utterly bored by something that doesn't put the fear of death in them. Subtly, Dante links this need for thrills and chills to the state of the world around the children. At school, Gene and his friends must conduct nuclear drills no less absurd than anything shown in the deliciously clichéd, lo-fi B-movie that gets shown later. One girl even rebels against this futility, screaming like Cassandra that they will all die anyway if the bomb hits. The kids were born into a world under the shadow of nuclear holocaust, and it would seem that the only way for them to feel a thrill is to experience some form of the apocalypse promised to them. They do not merely go to such movies to be entertained but to feel. This is a vicious satirical barb, but because the factors that contributed to this pervasive social conditioning are invisible, Dante does not use its visible victims as scapegoats. One of the director's great strengths as a satirist is his lack of judgment for the parties that get caught up in the ideas he skewers, and Matinee may show off Dante's fondest treatment of those at the mercy of a social mindset outside their control. Given Dante's own affinity for schlocky horror and special effects that are both impressive and relatively third-rate, the care with which he treats an audience's love of such things is flecked with autobiography and warm nostalgia*. Even the character of Woosley, openly based on gimmick-loving director William Castle but perhaps representative of some aspect of Dante himself, does not come under heavy fire. Woosley's elaborate theatrics, having some of his stock actors pose as outraged Christians protest his own movie to generate publicity, show the filmmaker exploiting some of the ridiculous reactions to entertainment. And as much as he uses his various tricks and stunts to become famous, he does have a genuine desire to please a crowd. That's not to say that Dante does not have fun with him, though: he portrays Woosley as a condescending man, demeaning to the same people he, deep down, loves. He refers to his prospective audience as rubes, but Dante slyly undermines Woosley's view of the locals at every turn. Gene ingratiates himself with the director when catches out the fake controversy by recognizing the actors from Woosley's movies. And the controversy itself only works because the townspeople react with calm maturity to the hysterical ravings of these dingbat moral shouters, telling the ostensible fundamentalists that they can make up their own minds about the movie's worth. The first half of Matinee can be a bit loose, splitting its attention between Woosley's journey to Key West and his setup of the premiere and the local kids' excitement for this coming attraction. Everything smashes together fantastically, however, when Dante gets down to the extended climax in the theater. All the kids, their lives and characteristics and relationships established, settle in for Mant!, Woosley's hilarious thriller about an irradiated man's formic transformation, and all hell breaks loose in glorious fashion. Mant! itself is one of the best parodies of Cold War sci-fi ever made, chiefly because of the love Dante puts into the spoof. The dialogue, with its fits of on-the-nose moralism and the occasional stab at clumsy wit, could almost pass for the real thing, while the cheap but inventive effects demonstrate the best of what rapidly produced, fatuously relevant B-movies of the era could achieve. But the best is saved for what happens around the movie. Woosley's technical gimmickry is so extreme he does not even bother with 3-D; that is simply too ordinary for what he wants. Instead, he overhauls the entire theater into an interactive spectacle that gives the crowd the chaos and terror they so desperately crave. Seats shake violently and the sound overwhelms with the din of Armageddon; a guy in a Mant costume roams among the kiddies, breaking the fourth wall and guaranteeing no one under the age of 12 will sleep for a week; and, finally, the whole shebang ends with an extradiegetic deconstruction that seems to burn away the screen to lay nakedly bare the underlying fear behind the picture. It is simultaneously the film's colossal punchline and its most brutal reminder that the silliest of entertainment can rest on the most serious of foundations. All around this spectacle, the kids have their own adventure, a corollary exercise in mock-nuclear fantasy that reaches its mad zenith when Gene and the aforementioned, combative girl (Lisa Jakub) find themselves trapped in the theater manager's top-of-the-line (yet, naturally, fraudulent and ineffective) bomb shelter as the man begs to get in, sure that a few coincidental lapses of mass communication mean the bombs must already be falling. The idea that we will know the end has come when the TV finally goes dark is perhaps the deftest satirical jab of them all. 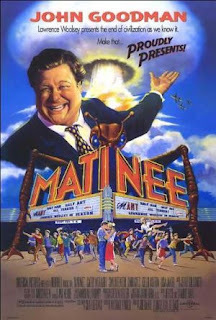 Matinee's first images are those of the nuclear bomb test footage from Nevada, those old declassified reels that gave people a glimpse of what the end of days might resemble. The government released such tapes as propagandic education, emphasizing atomic power but also turning into some kind of reassurance. Is it any wonder that films like Mant! should be so popular? Even the dark truths they perversely embody are played as entertainment. The best throwaway insight of the film comes when President Kennedy interrupts a TV movie to announce the Cuban Missile Crisis. Young Dennis, perplexed, calls his mom into the room, and even she has a quizzical look on her face. That's when it hit me: this is the first time television has been used to communicate a major crisis. Kennedy's was the first election run on television, and his administration also bore witness to the first great threat to the nation beamed live into the average home. Everyone looks somewhat confused by the president appearing with such grave news because there is no precedent for it. Television existed only to this point as an idiot box, projecting only images of mass consumption. Because of that, no one now knows how to react to something serious, a problem only exacerbated sense by the mingling of news with entertainment until everything resembles more the government-approved footage of nuclear tests than the sobering intrusion of unfettered reality. Matinee may be a delight for its cheeky humor and ingeniously cartoonish action, but insights such as these are as piercing as have ever been made about the way pop culture critiques and props up the horrors of reality. *In an unconnected but vital scene, Woosley illustrates for Gene complete with a sudden use of animation to craft a hypothetical cave painting out of graffiti, the image of a wooly mammoth morphing from a realistic interpretation into a sinister, threatening beast. It is the transformation of a caveman's literal view of something and his internal, emotional visualization of the same object, and one of the most evocative summaries of the power of the image that has ever made it to the screen.